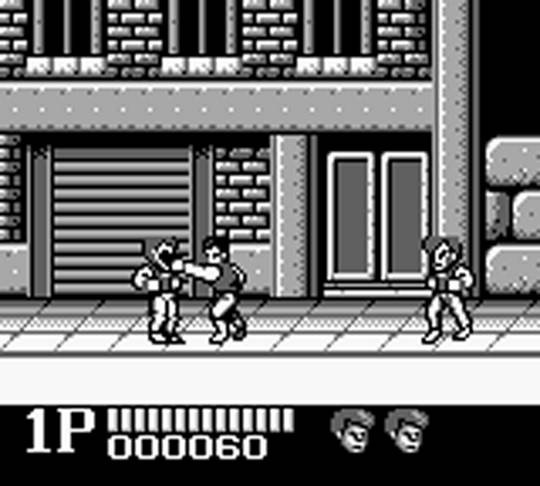 Double Dragon begins with Marion minding her own business when she is confronted and kidnapped by three thugs. She can remain calm, though. It's not because the cartoony visuals give the abduction a Donkey Kong vibe (even with a punch to the gut) – it's because her boyfriend is professional bottom-kicker Billy Lee. Based on the arcade game of the same name, Double Dragon sees you guide Billy through four levels, beating up criminals to get her back. As a scrolling beat 'em up, this has obvious similarities to the original game but a lot more in common with the NES version, resembling it both visually and aurally. At first glance it could be mistaken for this release (minus colour) with the same set of enemies and a very similar first level. However, as you progress, the differences become more noticeable, though you do visit the same locations. The graphics are fairly detailed for an early Game Boy title – the action remains clearly visible and each location has a different and interesting look, a trek through a woodland area being the best of the bunch. The D-pad is used to move while A punches and B kicks. Billy is not exactly Sonic the Hedgehog as he dawdles through the levels, but the controls are responsive and the gang members are somewhat lethargic, so you're not at an unfair disadvantage. Depending on where enemies are in relationship to you and/or the move you have just performed, a variety of different attacks are available including elbowing or throwing your assailant. There's not a huge amount here, but enough to stop the pummelling from getting too redundant. Additionally, if you don't want to waste time giving each and every foe a thorough beating, sometimes you can craftily knock them off a ledge. 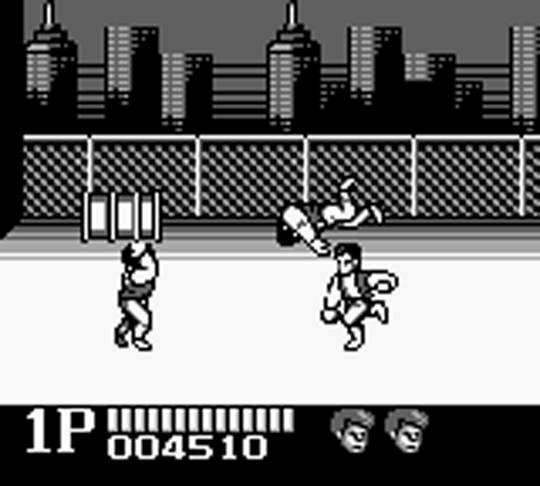 Press A and B together, and Billy will perform a jump-kick that is not only useful for knocking crooks out of your way but for leaping over gaps as well. You first have to use this ability on the second level, where conveyor belts try to send you towards a drop and a future as a human pizza. At first it can be difficult to judge the jumps, but it gets easier with repetition. However, it is not an ideal method, and accidental deaths may still occur. This can become an irritant in later parts of the game that require more jumps, with some sections playing like a platformer. 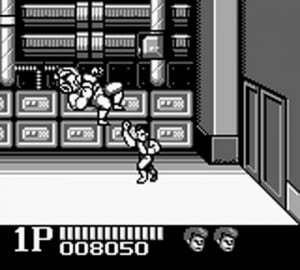 Double Dragon utilises a few sound effects such as swipes and crunches that are basic but effective. The ringing noise that accompanies the giant arcade-style thumb urging you on after clearing a screen of reprobates works particularly well. The music, however, is something of a mixed bag. The first level features a tune that fits well with the moody streets, but it can be painfully whiny at times, and the end-of-level boss music is a slow and depressing piece. Level two is much better and full of excitement whilst the remaining stages vary depending on what part you are at, sometimes adding to the atmosphere but on other occasions just serving to annoy. With only four levels, you can clear the game quickly, but it still provides some challenge. The first two areas are rather easy and teach you everything you need to know. 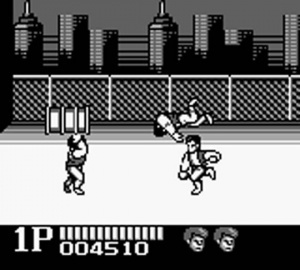 You'll get to fight the three basic thugs (with and without weapons) and the two bosses whilst you experiment with your moves and dabble with baseball bat-swinging and crate-throwing. While this section is not too challenging to get through (although the bosses can at first be tricky), things become more interesting in the second half, which you will not conquer quite so easily. There are only ever two enemies on-screen at a time, which makes fights with the standard thugs largely trouble-free, but you can quickly find your energy depleting should you get caught between them. As you progress, you'll also encounter trickier gaps to jump across, but a tougher challenge comes from the increase in boss characters. You have to beat level one's large, powerful fighter three times on the third stage. Get it right and you can beat him without picking up damage, but should he get a hold of you, you may struggle for the rest of the level – although you get an energy refill whenever you enter a new area. After dispatching him the first time, you are soon faced with level two's agile end boss – or, rather, three of him, including two at the same time, one of whom has a knife. The last stage is also tricky, with fights on small ledges and a gun-toting final boss. You may or may not know that Billy has a brother, Jimmy, who was controlled by a second person in the game's original two-player mode. Unfortunately, the 3DS Virtual Console version doesn't support this mode, making this single player only. Whilst this does mean 3DS players miss out on something Game Boy owners could indulge in 20 years ago, in truth it didn't add much to the game, being a basic versus mode that would be unlikely to hold either player's attention for long. The benefits of this re-release do include the standard Virtual Console features, such as suspended save state and restore points, useful if the final stages are causing you problems. 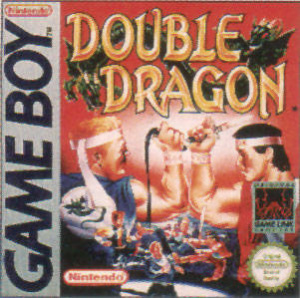 With a few different moves and weapons to experiment with, Double Dragon keeps the fighting interesting as you work through its varied environments. The first part of the game is a bit too easy, but it does a good job of training you up for the tougher second half. On the downside, using the jump attack to clear gaps takes a bit of getting used to and the music isn't always great (sometimes it's far from great). However, at the cheaper price point of £2.70 this is an offering that may appeal to fans of the series or genre. Overall this a short yet sweet experience. Still have the original cart, good times! 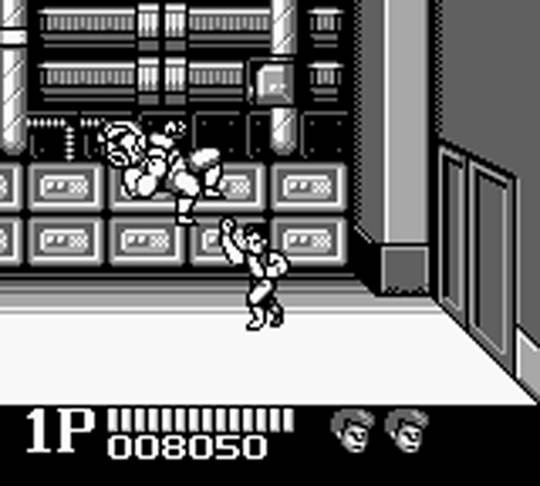 I've never enjoyed Double Dragon, so sadly, doesn't look like this will change my mind. I'll save my money for Kirby's Dream Land (c'mon ninty, Japan has it). I might get this just because I'm a sucker for beat em ups. Where the heck are the sequels to the first Nes game though? They still have yet to be released on the Wii VC. I wonder what the hold up is? Double Dragon Advance for the GBA remains as the best game in the series for me... but it's much more expensive now (at the ebay). If you can't afford that, by all means go for the GB version download.. I love Double Dragon in all formats and im happy to pay £2.70... but when can I buy an eShop card, like the E3 trailers there are no sign of them in the UK yet. This was a pretty good port. Spot on with the score for the game. Damn you, Abobo! I hate you! This game was actually my introduction to the Double Dragon series. I still have the original cart and I have to say it was a good port. If I had a 3DS I would pick this one up. I think I'll look more into this game before I pick it up. Good game, but DDII is better. I hope this game gets a US release soon on 3DS. I also agree with No.5 that DD for GBA was the best in the series. I won't be buying it. No way I'm supporting Nintendo removing multiplayer. Although Besides got to have some money for Kirby's Dream Land. I might actually get this when it comes out here. What version had Jimmy and Bimmy? I had the original cart for this game. But I sold it a few years back, kinda regret that. Compared to the NES game, this version really wasn't all that bad. @16: Double Dragon III on the NES. @15 Nintendo is removing multiplayer!? That just isn't right. I was hoping for games like mario tennis for gbc so i can play multiplayer with friends. Wait, can't nintendo just add wireless compatibility for multiplayer gameplay? Wait, can't nintendo just add wireless compatibility for multiplayer gameplay? Maybe its possible, but they won't - they would have done so already if they were going to. They're not removing anything. You're just playing the games as if you did not have a link cable the same way you play N64 games on the Wii VC as if you did not have a controller pak or rumble pak. Yeah, its a decent game. Too hard for me though so thank Nintendo for save states. Even with them the game is still quite hard. It would be impossible without them I think. 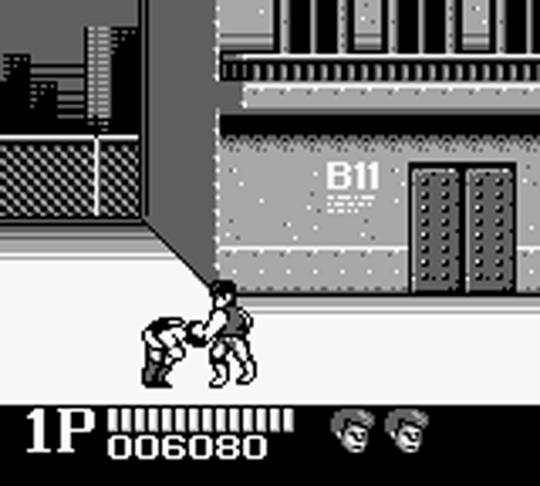 For the time, it was a good version of Double Dragon and is still fun to play through today. Levels 3 and 4 amp up the difficulty quite a bit, just as the review says. It is possible to beat without the Game Genie or VC save states, but you have to play a near perfect game to do it. Helps a great deal if you get the hang of how to make the precision jumps in the platforming portions of stages 2 and 3. Figuring out enemy patterns will also go a long way to helping you see the end.